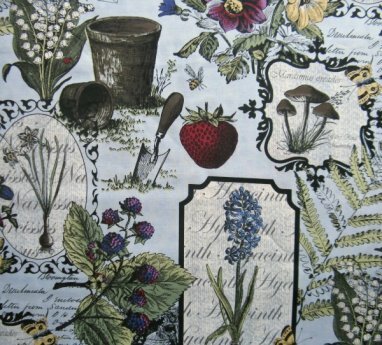 Below you will find brief commentaries on fabrics that have particularly inspired us or just caught our eye--we hope you will enjoy these designs as much as we do! Now, isn’t this fun?! 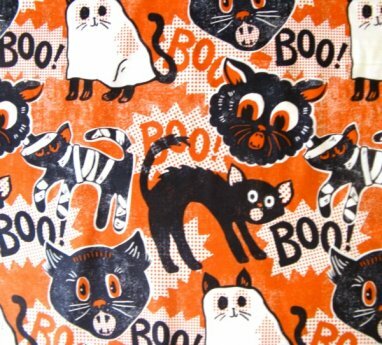 Yes, it’s true, there is a definite strain of kitsch in this Halloween print, and I am a sucker for kitsch at times. But kitsch is everywhere today, isn’t it? And too often it devolves into an arch, smug species of irony that holds the past up to ridicule without explanation or alternative. What I think saves this fabric, which is from a new Blend collection called Spooktacular, from such a taint—and therefore makes it worthy of notice—is its utter sincerity and its complete success on its own terms. The cats are simple, wide-eyed, and fun, drawn in a style that reminds me of comic strips from the 1910s and 1920s. They are too innocent to go for the laugh, but they earn it on the strength of their undeniable charm. How perfect this would be for a trick-or-treat bag, or a big ol’ duvet cover for the kids’ room! And did I mention that we have three other prints in Maude Asbury's Spooktacular collection, and each of them shares the same guileless sincerity and sense of fun? Take a look! 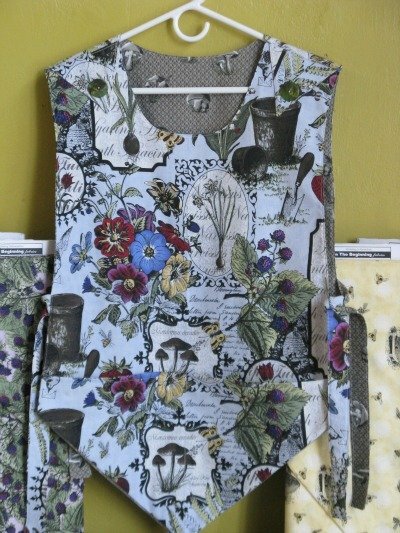 Okay, the winner is this marvelous big floral print from an older Riley Blake collection. I’ve used this beauty in at least two quilts, and I have a well-worn apron at home made from it. The flowers are beautiful geometric mandalas, which would love to be echoed in quilting, don’t you think? The flowers and the luminescent red berries appear to float over the monochromatic green silhouetted vines and leaves. And it has just dawned on me why I may have been especially drawn to this particular fabric today: yesterday at an estate sale I picked up a lovely old (1929) edition of Robert Louis Stevenson’s A Child’s Garden of Verses, with illustrations by Eulalie Banks, who went simply by the name Eulalie. You have probably seen her illustrations, but here’s a reminder: http://pinterest.com/ruthmcneill/illustrator-eulalie-banks/. Now, don’t you think that my fabric pick would be right at home in one of Eulalie’s beautiful illustrations? Ann and I were at the Thimbleweeds show in Rio Rancho recently, where we were selling fabric off-site for the first time. We could only guess at what visitors would want us to have available, but I knew immediately that we were among kindred spirits because people snapped up all of the Kaffe Collective charm packs and design rolls we had almost before we were completely set up. The quilterati pay lip service to the work of Kaffe Fassett, Philip Jacobs and Brandon Mably on the basis of their manifest talent and their sheer panache, but many will hesitate to use their fabric—Kaffe’s color choices can be so highly keyed and unexpected and even fraught with tension, their designs are often at a scale that seems to demand large pieces, their collections don’t always have conventional “color ways” or else they emerge only over a period of years. However, design junkies love them for precisely these reasons—and more. 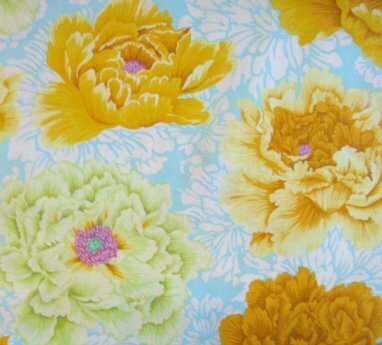 Take this boffo print, for example: Philip Jacobs’ Brocade Peony is My Favorite Fabric from the Kaffe Collective’s new Spring 2013 collection. In it is the full afternoon light of a mid-summer day, a white-yellow brightness that is not glaring but yet saturates your eyes and skin more than any heat. The peonies are in yellow and gold and lime—not unprecedented colors, I suppose, but the rendering is so realistic that the heightened colors make the peonies surreal. This is a trademark of the group’s work, as are the little explosions of unexpected color that occur at the heart of each flower, hot magenta and pink surrounding a cool, still heart of green. The “brocade” provides a nice contrast in every sense, a background layer of almost flat stenciled light against a sky-blue ground that does not seem to me to cool the flowers, but rather to hold them in balance, allowing them to shimmer. It is a refreshing, intoxicating print, one that I am happy to be able to offer at 20% off this week. I can still remember seeing Jules Davis’ Garden of Delights collection for the first time in the Anna Griffin/Blend display area at the 2011 Quilt Market in Houston. From “across a large and [very] crowded room,” it communicated the trademark elegance that one associates with the brand, but it also had a lightness, a summery quality that particularly attracted me. These qualities shine through in Davis’ design and color choices: just look at this print, called Hummingbird Taupe, which is my favorite from the collection. It features the sinuous, gently flowing curves of a classic damask or brocade, but delicately balanced with rectilinear elements—an all too rare feat of restraint, since so many late18th-19th century renditions are incoherent masses of swirls and curlicues. This pared-down look is accentuated by the use of silhouettes. And did you notice that the silhouettes are not just the usual vegetable and hummingbird forms, but also dragonflies and moths, for an ever so slightly Gothic touch?! The colors are a bit odd, I must say. The taupe background gives you a lot of choices, and Davis chose a pleasant and recessive silver-ish grey, a mildly acidic chartreuse, a rather rich olive and, finally, a surprisingly intense orange. 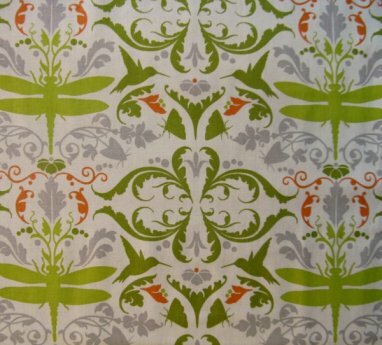 The unexpected harmony of these colors shows up best when viewing the full collection—within the Hummingbird Taupe print, the effect is to create three clear planes on which the pattern elements operate, ranging from the rather aggressive, eye-popping orange through the greens to the recessive grey layer. I admire Davis’ skill in making each of these layers stand up on its own, even as they work together visually. Each color field has elements that work both lengthwise and across the fabric, and they are distributed masterfully, creating a wonderful balance that allows the eye to move easily, both across the design and through its planes or layers, without carrying it in any direction. Brava!! I adore almost all of the fabric at ThreadBear, but my favorite fabric shifts from one moment to the next. And the arrival of our UPS man, James, can change everything. Here is the fabric James brought this week with which I am presently in love. It’s orange, which is always a plus with me, and it has commas and periods printed on it! Now, isn’t that fun? 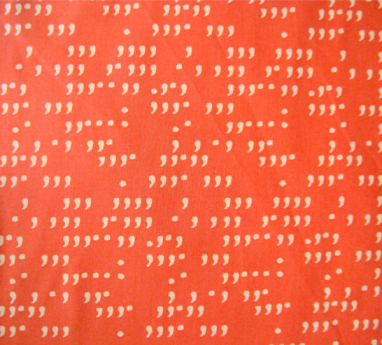 The punctuation marks are sort of an orange-yellow, so the fabric can work as a tonal blender. What I love about subtle but literal prints like this one is that they can be a fun little secret that you put in your quilt. Doesn’t it make you smile when you see the old quilts with feedsack prints in them? Those happy little bunnies and dancing dishes? Well, fifty years from now somebody will spot this fabric in an “old” quilt and say, “Look! Doesn’t that look like commas and periods? How weird!” I love that. It’s like sending a little joke into the future. Batiks exude a kind of mystery, don't they? The wax-resist dyeing process and its multiple color applications often creates bleeds and irregularly blurred patterns that confound the eye momentarily with dreamlike images. 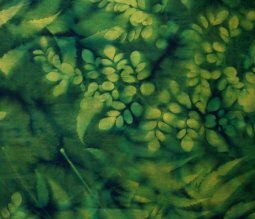 The two batiks I am particularly loving right now embody the best of that distinctive batik look: they are essentially the same "print" (allowing for the variations inevitable in batiks) that I have perhaps unflatteringly dubbed an "undergrowth" of branches, leaves and ferns. Some leave their image on the fabric with an immediacy that is almost tangible, while surrounding images have been wiped so that the foliage seems to emerge from a heavy mist or melt into the impenetrable background of darker tones. Unlike many batiks, these are strictly tonal, so they have none of the muddy areas that mar many batiks. And those basic tones are intense greens or blues, giving these fabrics a rich and vivid look that I find irresistible. These particular little thickets of batik have been here for awhile, but what made me focus on them again is the prospect of ThreadBear's forthcoming Batik Sale, which begins tomorrow and continues through April 6th. During the sale, you can save 20% on ALL batiks in our store and 25% when you order online (though I admit we only have about a quarter of our batiks on the website thus far). So as a special bonus, these two FAVORITE FABRICS will 30% off while our supply holds out! Better hurry--the green especially will not last long! A fabric may appeal to us for any number of reasons: sometimes it is a beautiful or well composed pattern; sometimes it’s the color(s), singly or in combination; sometimes it is a subject we like; occasionally it may even display wit. 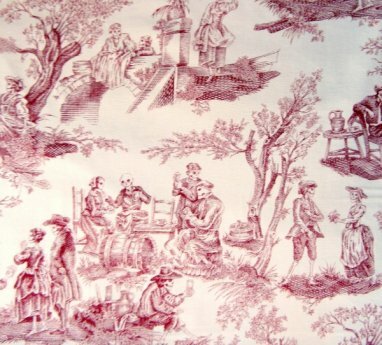 My Favorite Fabric today is one of those rare prints that has it all! Alexander Henry calls this “Midnight Pastoral” and it is, well, delightful. 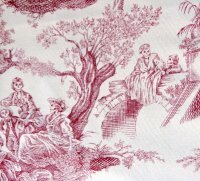 The pastoral is a familiar, time-honored Baroque/Rococo motif, featuring beautiful young people disporting themselves in a bucolic setting—think of Watteau’s Embarkation for Cythera or a Claude Lorrain landscape or your favorite Wedgwood china. This print is a convincing evocation of that style, right down to the cross-hatched technique that evokes the etchings and lithographs that were so popular during that period. Even today, the theme is so recognizable that our minds can instantly fill in its details—the romantic ruins, the feathery trees, the tri-corner hats and aproned dresses, the graceful poses of the courtly lovers. Sounds charming, yes? It is only when you look closer at this print that the shoe drops: these are not the handsome lords and ladies our eye expect to find, but skeletons frolicking amongst the ruins. (Hence the “Midnight” of the title!) You can take it simply as subversive humor--which it is, of course. But it is also absolutely in keeping with the Mexican tradition of La Dia de los Muertos (the Day of the Dead), since it is not only a celebratory remembrance of one’s ancestors, but has a strong emphasis on the memento mori as well. And one of the archetypal eighteenth century representations of “As I am, so shall you be” was, you guessed it, that courtly scene of (fleeting) earthly pleasures amidst the transitory beauty of nature. You can’t tell me that Jose Posada, whose prints form so much of the basis of the art of Dia de los Muertos, wasn’t consciously following in this Baroque tradition. Okay, so maybe this is too much to read into a piece of fabric for your shirt or quilt border, so let’s just leave it at this: it’s lovely in color and design, it’s clever in concept, and it’s firmly part of a tradition that is still strong here in northern New Mexico. Why would you not want a piece of this? Around here, we like pretty much anything Jason Yenter does, but this is my hands-down favorite. Let me tell you why: first off, it’s on a clear, pale blue ground; it’s got mushrooms (always a plus) and bees and lilies of the valley; it’s got gorgeous big cornflower blue and butter yellow and scarlet and magenta anemones; tucked into the corners, by the blackberries, are skep beehives. I could go on and on because I keep finding more to enjoy. 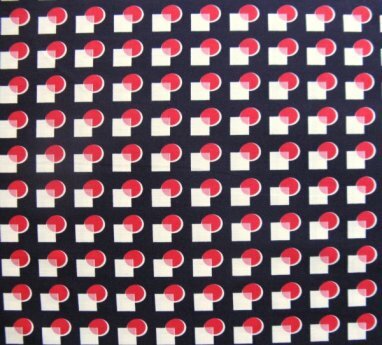 Without even trying, I can think of about a dozen people who deserve to have something made out of this fabric. In fact, a rather big and loud part of me wants nothing more than to hide this bolt under the cutting table and hoard the rest of it!! But no, I’m going to be nice and offer it to you for 20% off. This week only, dearies. 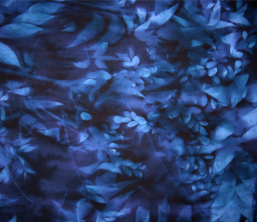 It is difficult to describe the mysterious visual qualities of indigo dye--to me, the first word that comes to mind is gravity: indigo has a weight and depth of color that pulls you inward, downward to a place that is still, quiet, timeless. 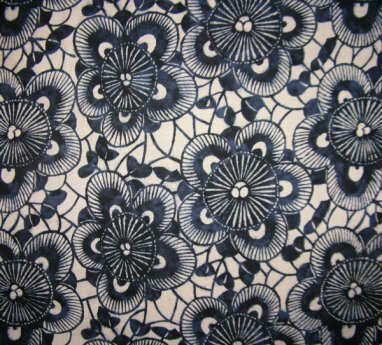 Indigo textile dyeing originated in China thousands of years ago, but for the past millenium its true masters have been Japanese artisans working in the ai-zome tradition. And it is that tradition Moda has evoked with great success in its Kasuri collection, which features prints and distressed solids in a couple of different shades of indigo, as well as in a taupe-ish tan that has something of the look of older Japanese porcelain. Spring is in the air and I’ve got FAIRY fabric on my mind! Now, these aren’t your everyday Disney- style fairies. Oh, no. 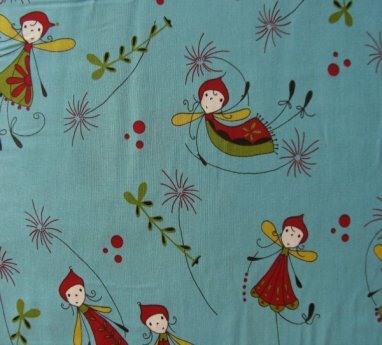 These fairies come from our friends at Lecien and they are cute and whimsical but manag to be very modern. Just look at the colors: the background is a pure turquoise blue, the little fairy frocks are olive and red red, and their fairy wings are a sunny golden yellow. Too, too wonderful, and 20% off this week! When fabric reps show us their new products, they present them as collections, often containing up to twelve or fifteen different coordinates in two or three or more color ways. Occasionally we may buy a full collection, but usually we are mining them for individual gems that we may pluck out to carry in our shop. We thought Denyse Schmidt's new Shelburne Falls collection was very good, from top to bottom, so you will see several of the prints from a lovely rose-black-cool turquoise color way, plus pre-cuts, in our online Shop. However, I particularly love this rather Art Deco (or perhaps it is Op Art) print that she has offered to support a grouping in which the featured fabrics are--you guessed it--florals. "Circles and Squares" is sharp in color, pattern and contrast, but its interplay of two- and three-dimensional elements make the potentially austere geometry playful--it invites the eye to rest and explore even as the linear repetition of elements is telling the eye to move on. That tension can be a real asset in a thoughtfully composed quilt, I think, and not easy to find, so that is why "Circles and Squares" is one of OUR FAVORITE FABRICS. Ann and I are both Alexander Henry groupies--they produce bold, inventive, large-scale prints that are rare among quilting cottons, and they do it with a flair for color and a wit that comes right up to the edge of camp...and sometimes soars fearlessly over the edge! 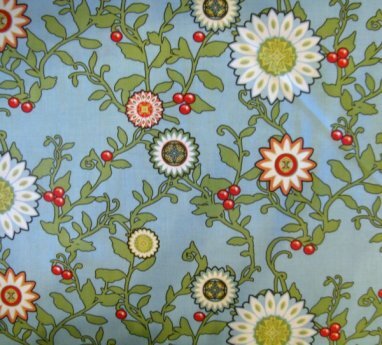 Alexander Henry fabrics are also notable for prints that feature Hispanic motifs. My current favorite is a new design for this season that they have aptly titled "Talavera Garden," for the print evokes majolica tilework delightfully, but at such a scale that the loose, spontaneous brushwork really shines. Part of its charm, I think, is the balance it achieves between the bright, varied colors (which the brushwork renders rather translucent) and the strong white ground. The small image on the page may make it seem a little dense and chaotic, but when you see it up close (click on the "larger image" if you're looking at this online), it succeeds completely. 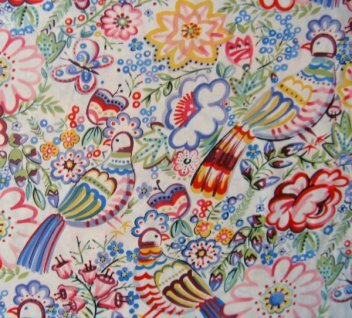 It has continuous visual interest, which is necessary in quilting and fashion fabric, but yet it breathes and glows like talavera pottery should. This is just a happy fabric, don't you think? It makes me smile, so for today at least, it is MY FAVORITE FABRIC. And by the way, kudos to the DeLeon Design Group for this and their other new offerings for this season, particularly the fun Lotteria cards, a really bold African print called Kibibi, and the black tonal "After Dark." These all have such a quintessentially Alexander Henry look that I suspect this "design group" may be a name given to part of the company's hitherto uncredited in-house design team. Does anybody know whether this might be true? True or not, any recognition having their name on the selvage brings is deserved. Wow! ThreadBear’s first-ever FABRIC OF THE DAY! Do I even have to tell you how hard it was to choose just one? But I did, and it’s kind of a sleeper. This is a fabric that has been calling out to me quietly ever since its arrival. (Sometimes it says it would like to be made into a big, slouchy bag; other times it wants a quilt built around it.) 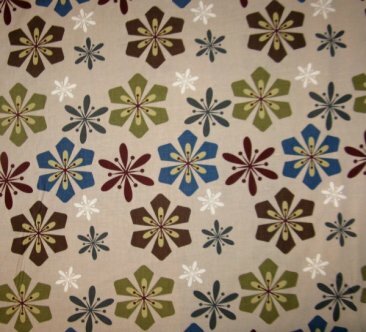 From Blank Quilting’s Graphic Garden collection, it features tangerine-size geometric flowers on a pale taupe background, and the best descriptor I can come up with is “atomic modern.” This one would have been right at home in my mom’s kitchen, circa 1964. Want some of this fabric for yourself? Click here.